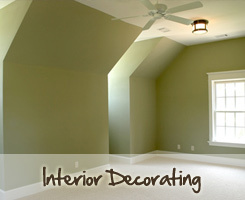 Interior Painting & Decorating. A schedule of painting and decorating works is drawn up after an initial assessment and discussion with the customer. We do all we can to adhere to the schedule as much as is possible. We will arrive at the time agreed, carefully clear your room and cover your floors and furnishings with large dust sheets to minimise any accidental paint spillage or dust contamination. Guranteed FREE Quotes - We provide quotes. Our prices are guaranteed so you will not find any hidden costs on completion of work. For a friendly reliable service, call for a free quote 01389 600 769 or visit the contact page.